Angiotensin is a peptide hormone that causes vasoconstriction and an increase in blood pressure. It is part of the renin–angiotensin system, which regulates blood pressure. Angiotensin also stimulates the release of aldosterone from the adrenal cortex to promote sodium retention by the kidneys. An oligopeptide, angiotensin is a hormone and a dipsogen. It is derived from the precursor molecule angiotensinogen, a serum globulin produced in the liver. Angiotensin was isolated in the late 1930s (first named 'angiotonin' or 'hypertensin') and subsequently characterized and synthesized by groups at the Cleveland Clinic and Ciba laboratories. Angiotensinogen is also known as renin substrate. Human angiotensinogen is 452 amino acids long, but other species have angiotensinogen of varying sizes. The first 12 amino acids are the most important for activity. Angiotensin I (CAS# 11128-99-7), officially called proangiotensin, is formed by the action of renin on angiotensinogen. Renin cleaves the peptide bond between the leucine (Leu) and valine (Val) residues on angiotensinogen, creating the decapeptide (ten amino acid) (des-Asp) angiotensin I. Renin is produced in the kidneys in response to renal sympathetic activity, decreased intrarenal blood pressure (<90mmHg systolic blood pressure ) at the juxtaglomerular cells, or decreased delivery of Na+ and Cl- to the macula densa. If a reduced NaCl concentration in the distal tubule is sensed by the macula densa, renin release by juxtaglomerular cells is increased. This sensing mechanism for macula densa-mediated renin secretion appears to have a specific dependency on chloride ions rather than sodium ions. Studies using isolated preparations of thick ascending limb with glomerulus attached in low NaCl perfusate were unable to inhibit renin secretion when various sodium salts were added but could inhibit renin secretion with the addition of chloride salts. This, and similar findings obtained in vivo, has led some to believe that perhaps "the initiating signal for MD control of renin secretion is a change in the rate of NaCl uptake predominantly via a luminal Na,K,2Cl co-transporter whose physiological activity is determined by a change in luminal Cl concentration." Angiotensin I appears to have no direct biological activity and exists solely as a precursor to angiotensin II. Angiotensin I is converted to angiotensin II (AII) through removal of two C-terminal residues by the enzyme angiotensin-converting enzyme (ACE), primarily through ACE within the lung (but also present in endothelial cells, kidney epithelial cells, and the brain). Angiotensin II acts on the CNS to increase vasopressin production, and also acts on venous and arterial smooth muscle to cause vasoconstriction. Angiotensin II also increases aldosterone secretion, therefore, it acts as an endocrine, autocrine/paracrine, and intracrine hormone. ACE is a target of ACE inhibitor drugs, which decrease the rate of angiotensin II production. Angiotensin II increases blood pressure by stimulating the Gq protein in vascular smooth muscle cells (which in turn activates an IP3-dependent mechanism leading to a rise in intracellular calcium levels and ultimately causing contraction). In addition, angiotensin II acts at the Na+/H+ exchanger in the proximal tubules of the kidney to stimulate Na reabsorption and H+ excretion which is coupled to bicarbonate reabsorption. This ultimately results in an increase in blood volume, pressure, and pH. Hence, ACE inhibitors are major anti-hypertensive drugs. Other cleavage products of ACE, seven or 9 amino acids long, are also known; they have differential affinity for angiotensin receptors, although their exact role is still unclear. The action of AII itself is targeted by angiotensin II receptor antagonists, which directly block angiotensin II AT1 receptors. Angiotensin II is degraded to angiotensin III by angiotensinases located in red blood cells and the vascular beds of most tissues. It has a half-life in circulation of around 30 seconds, whereas, in tissue, it may be as long as 15–30 minutes. Angiotensin III has 40% of the pressor activity of angiotensin II, but 100% of the aldosterone-producing activity. Increases mean arterial pressure. Angiotensin IV is a hexapeptide that, like angiotensin III, has some lesser activity. Angiotensin IV has a wide range of activities in the central nervous system. The exact identity of AT4 receptors has not been established. There is evidence that the AT4 receptor is insulin-regulated aminopeptidase (IRAP). There is also evidence that angiotensin IV interacts with the HGF system through the c-Met receptor. Synthetic small molecule analogues of angiotensin IV with the ability to penetrate through blood brain barrier have been developed. They are potent direct vasoconstrictors, constricting arteries and veins and increasing blood pressure. This effect is achieved through activation of the GPCR AT1, which signals through a Gq protein to activate Phospholipase C, and subsequently increase intracellular calcium. Angiotensin II has prothrombotic potential through adhesion and aggregation of platelets and stimulation of PAI-1 and PAI-2. When cardiac cell growth is stimulated, a local (autocrine-paracrine) renin–angiotensin system is activated in the cardiac myocyte, which stimulates cardiac cell growth through protein kinase C. The same system can be activated in smooth muscle cells in conditions of hypertension, atherosclerosis, or endothelial damage. Angiotensin II is the most important Gq stimulator of the heart during hypertrophy, compared to endothelin-1 and α1 adrenoreceptors. Angiotensin II increases thirst sensation (dipsogen) through the area postrema and subfornical organ of the brain, decreases the response of the baroreceptor reflex, increases the desire for salt, increases secretion of ADH from the posterior pituitary, and increases secretion of ACTH from the anterior pituitary. It also potentiates the release of norepinephrine by direct action on postganglionic sympathetic fibers. Angiotensin II acts on the adrenal cortex, causing it to release aldosterone, a hormone that causes the kidneys to retain sodium and lose potassium. Elevated plasma angiotensin II levels are responsible for the elevated aldosterone levels present during the luteal phase of the menstrual cycle. Angiotensin II has a direct effect on the proximal tubules to increase Na+ reabsorption. It has a complex and variable effect on glomerular filtration and renal blood flow depending on the setting. Increases in systemic blood pressure will maintain renal perfusion pressure; however, constriction of the afferent and efferent glomerular arterioles will tend to restrict renal blood flow. The effect on the efferent arteriolar resistance is, however, markedly greater, in part due to its smaller basal diameter; this tends to increase glomerular capillary hydrostatic pressure and maintain glomerular filtration rate. A number of other mechanisms can affect renal blood flow and GFR. High concentrations of Angiotensin II can constrict the glomerular mesangium, reducing the area for glomerular filtration. Angiotensin II is a sensitizer to tubuloglomerular feedback, preventing an excessive rise in GFR. Angiotensin II causes the local release of prostaglandins, which, in turn, antagonize renal vasoconstriction. The net effect of these competing mechanisms on glomerular filtration will vary with the physiological and pharmacological environment. ^ Basso N, Terragno NA (December 2001). "History about the discovery of the renin-angiotensin system". Hypertension. 38 (6): 1246–9. doi:10.1161/hy1201.101214. PMID 11751697. ^ "JAMA Article Jan 2012". ^ Williams GH, Dluhy RG (2008). "Chapter 336: Disorders of the Adrenal Cortex". In Loscalzo J, Fauci AS, Braunwald E, Kasper DL, Hauser SL, Longo DL. Harrison's principles of internal medicine. McGraw-Hill Medical. ISBN 978-0-07-146633-2. ^ Skott O, Briggs JP (1987). "Direct demonstration of macula densa-mediated renin secretion". Science. 237 (4822): 1618–1620. doi:10.1126/science.3306925. ^ Kirchner KA, Kotchen TA, Galla JH, Luke RG (November 1978). "Importance of chloride for acute inhibition of renin by sodium chloride". The American Journal of Physiology. 235 (5): F444–50. doi:10.1152/ajprenal.1978.235.5.F444. PMID 31796. ^ Kim SM, Mizel D, Huang YG, Briggs JP, Schnermann J (May 2006). "Adenosine as a mediator of macula densa-dependent inhibition of renin secretion". American Journal of Physiology. Renal Physiology. 290 (5): F1016–23. doi:10.1152/ajprenal.00367.2005. PMID 16303857. ^ a b Schnermann JB, Castrop H (2013). "Chapter 23: Function of the juxtaglomerular apparatus: control of glomerular hemodynamics and renin secretion.". In Alpern RJ, Moe OW, Caplan M. Seldin and Giebisch's The Kidney (Fifth ed.). Academic Press. pp. 757–801. doi:10.1016/B978-0-12-381462-3.00023-9. ISBN 978-0-12-381462-3. ^ Le, Tao (2012). First Aid for the Basic Sciences. Organ Systems. McGraw-Hill. p. 625. ^ Chai SY, Fernando R, Peck G, Ye SY, Mendelsohn FA, Jenkins TA, Albiston AL (November 2004). "The angiotensin IV/AT4 receptor". Cellular and Molecular Life Sciences. 61 (21): 2728–37. doi:10.1007/s00018-004-4246-1. PMID 15549174. ^ Gard PR (December 2008). "Cognitive-enhancing effects of angiotensin IV". BMC Neuroscience. 9 Suppl 2: S15. doi:10.1186/1471-2202-9-S2-S15. PMC 2604899. PMID 19090988. ^ Albiston AL, McDowall SG, Matsacos D, Sim P, Clune E, Mustafa T, Lee J, Mendelsohn FA, Simpson RJ, Connolly LM, Chai SY (December 2001). "Evidence that the angiotensin IV (AT(4)) receptor is the enzyme insulin-regulated aminopeptidase". The Journal of Biological Chemistry. 276 (52): 48623–6. doi:10.1074/jbc.C100512200. PMID 11707427. ^ Wright JW, Harding JW (2015-01-01). "The Brain Hepatocyte Growth Factor/c-Met Receptor System: A New Target for the Treatment of Alzheimer's Disease". Journal of Alzheimer's Disease. 45 (4): 985–1000. doi:10.3233/JAD-142814. PMID 25649658. ^ a b Wright JW, Kawas LH, Harding JW (February 2015). "The development of small molecule angiotensin IV analogs to treat Alzheimer's and Parkinson's diseases". Progress in Neurobiology. 125: 26–46. doi:10.1016/j.pneurobio.2014.11.004. PMID 25455861. ^ Yvan-Charvet L, Quignard-Boulangé A (January 2011). "Role of adipose tissue renin-angiotensin system in metabolic and inflammatory diseases associated with obesity". Kidney International. 79 (2): 162–8. doi:10.1038/ki.2010.391. PMID 20944545. ^ Kanaide H, Ichiki T, Nishimura J, Hirano K (November 2003). "Cellular mechanism of vasoconstriction induced by angiotensin II: it remains to be determined". Circulation Research. 93 (11): 1015–7. doi:10.1161/01.RES.0000105920.33926.60. PMID 14645130. ^ Skurk T, Lee YM, Hauner H (May 2001). "Angiotensin II and its metabolites stimulate PAI-1 protein release from human adipocytes in primary culture". Hypertension. 37 (5): 1336–40. doi:10.1161/01.HYP.37.5.1336. PMID 11358950. ^ Gesualdo L, Ranieri E, Monno R, Rossiello MR, Colucci M, Semeraro N, Grandaliano G, Schena FP, Ursi M, Cerullo G (August 1999). "Angiotensin IV stimulates plasminogen activator inhibitor-1 expression in proximal tubular epithelial cells". Kidney International. 56 (2): 461–70. doi:10.1046/j.1523-1755.1999.00578.x. PMID 10432384. ^ a b Johnson AK, Gross PM (May 1993). "Sensory circumventricular organs and brain homeostatic pathways". FASEB Journal. 7 (8): 678–86. doi:10.1096/fasebj.7.8.8500693. PMID 8500693. ^ Shaver SW, Kadekaro M, Gross PM (December 1989). "High metabolic activity in the dorsal vagal complex of Brattleboro rats". Brain Research. 505 (2): 316–20. doi:10.1016/0006-8993(89)91459-5. PMID 2598049. ^ Gross PM, Wainman DS, Shaver SW, Wall KM, Ferguson AV (March 1990). "Metabolic activation of efferent pathways from the rat area postrema". The American Journal of Physiology. 258 (3 Pt 2): R788–97. doi:10.1152/ajpregu.1990.258.3.R788. PMID 2316724. ^ Boulpaep EL, Boron WF (2005). Medical Physiology: a Cellular and Molecular Approach. St. Louis, Mo: Elsevier Saunders. p. 771. ISBN 978-1-4160-2328-9.
de Gasparo M, Catt KJ, Inagami T, Wright JW, Unger T (September 2000). "International union of pharmacology. XXIII. The angiotensin II receptors". Pharmacological Reviews. 52 (3): 415–72. PMID 10977869. Brenner & Rector's The Kidney, 7th ed., Saunders, 2004. Mosby's Medical Dictionary, 3rd Ed., CV Mosby Company, 1990. Lees KR, MacFadyen RJ, Doig JK, Reid JL (August 1993). "Role of angiotensin in the extravascular system". Journal of Human Hypertension. 7 Suppl 2: S7–12. PMID 8230088. Weir MR, Dzau VJ (December 1999). "The renin-angiotensin-aldosterone system: a specific target for hypertension management". American Journal of Hypertension. 12 (12 Pt 3): 205S–213S. doi:10.1016/S0895-7061(99)00103-X. PMID 10619573. Berry C, Touyz R, Dominiczak AF, Webb RC, Johns DG (December 2001). "Angiotensin receptors: signaling, vascular pathophysiology, and interactions with ceramide". American Journal of Physiology. Heart and Circulatory Physiology. 281 (6): H2337–65. doi:10.1152/ajpheart.2001.281.6.H2337. PMID 11709400. Sernia C (January 2001). "A critical appraisal of the intrinsic pancreatic angiotensin-generating system". Journal of the Pancreas. 2 (1): 50–5. PMID 11862023. Varagic J, Frohlich ED (November 2002). "Local cardiac renin-angiotensin system: hypertension and cardiac failure". Journal of Molecular and Cellular Cardiology. 34 (11): 1435–42. doi:10.1006/jmcc.2002.2075. PMID 12431442. Wolf G (2006). "Role of reactive oxygen species in angiotensin II-mediated renal growth, differentiation, and apoptosis". Antioxidants & Redox Signaling. 7 (9–10): 1337–45. doi:10.1089/ars.2005.7.1337. PMID 16115039. Cazaubon S, Deshayes F, Couraud PO, Nahmias C (April 2006). "[Endothelin-1, angiotensin II and cancer]". Medecine Sciences. 22 (4): 416–22. doi:10.1051/medsci/2006224416. PMID 16597412. Ariza AC, Bobadilla NA, Halhali A (2007). "[Endothelin 1 and angiotensin II in preeeclampsia]". Revista de Investigacion Clinica; Organo del Hospital de Enfermedades de la Nutricion. 59 (1): 48–56. PMID 17569300. Wikimedia Commons has media related to Angiotensin. 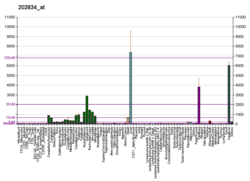 Human AGT genome location and AGT gene details page in the UCSC Genome Browser.